Most people spend more time planning their next vacation than planning their finances. I’m passionate about travel, but I’m equally as passionate about taking control of your finances. This was instilled into me long before I started working in the financial services industry. I remember my Dad saving his quarters, dimes and nickels in piles of jars on his dresser to pay for our family vacation each year. Since then, I’ve lived by a few simple money mantras: live within your means, pay yourself first, buy insurance to take care of your loved ones. But just like everybody else, I know there are other things I should be doing to improve my financial health. That’s why I was so excited when we came up with the idea at work to promote the launch of our new social media channels and Financial Literacy Month with a Financial Weight Loss Challenge. Money can’t buy happiness, but it can buy you peace of mind. This week’s #HappyAct is to take the #FinancialWeightLoss challenge. Take action this month to take control of your finances and lose the weight of whatever financial decision is weighing you down. 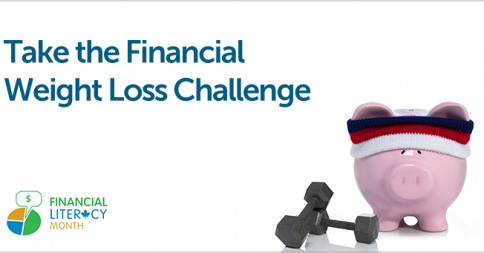 Challenge your friends and family members by sharing the Financial Weight Loss challenge post on the Empire Life Facebook page (and like us while you’re there). We’re also running a contest where you can win either a $100 VISA gift card or iPad mini. Be sure to share what one action you are going to take. Good luck with your research on cell-phone providers! We pay way too much and there doesn’t seem to be any way around it. Good luck with your research on cell-phone providers, I have looked at several and have found it is just to much money to pay each month. For that reason I am, not going to have a cell phone. People can get in touch with me when I am at home or at work. To much time is spent on the phone talking and texting we have lost the art of talking to each other face to face. So my money each month will be be saved and I will talk to people from home and I will use my camera to take photos. Save and use what we have already.